Both of these designs were knit in Valley Yarns Northampton. 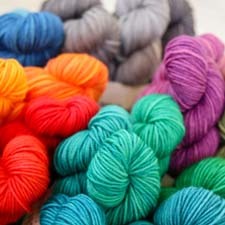 This is one of our core yarn lines and it’s available in over 40 colors. With a wide variety of heathers and solids with an incredible depth of color, there’s no end to the possible color combinations you can add to your wardrobe. 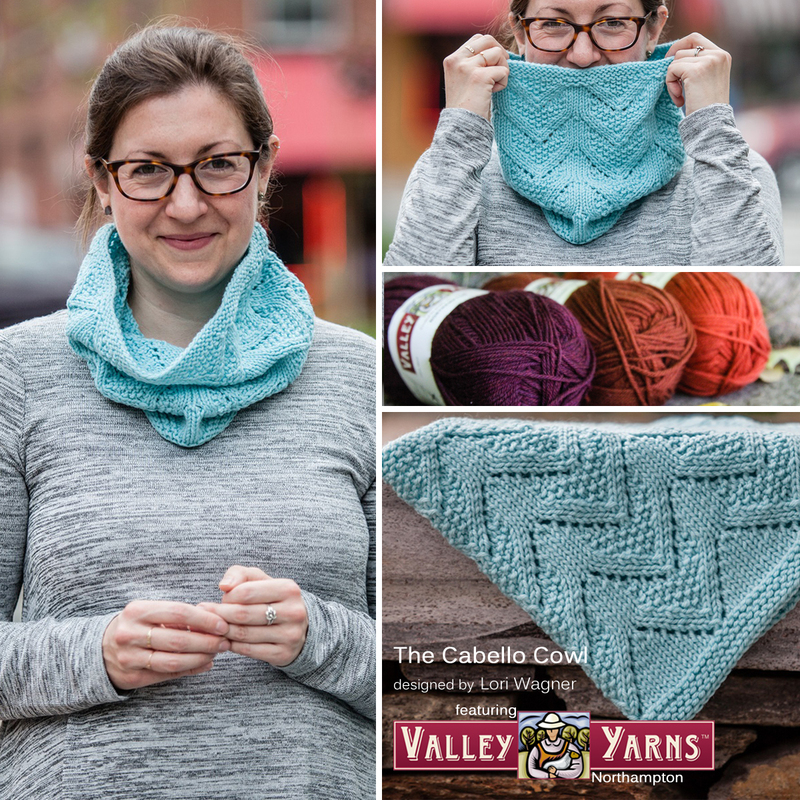 Just one skein of Northampton is all you need for the Cabello Cowl, making it a project that cost under $12.00! 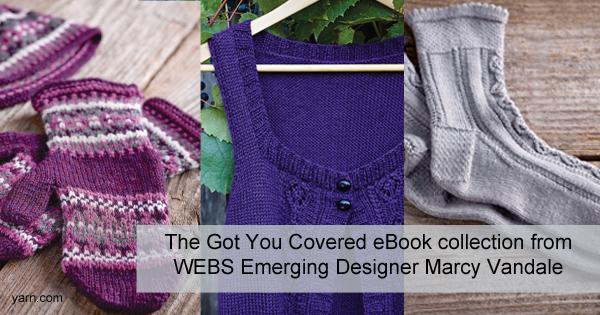 Get your needles ready and get some holiday gift knitting started! 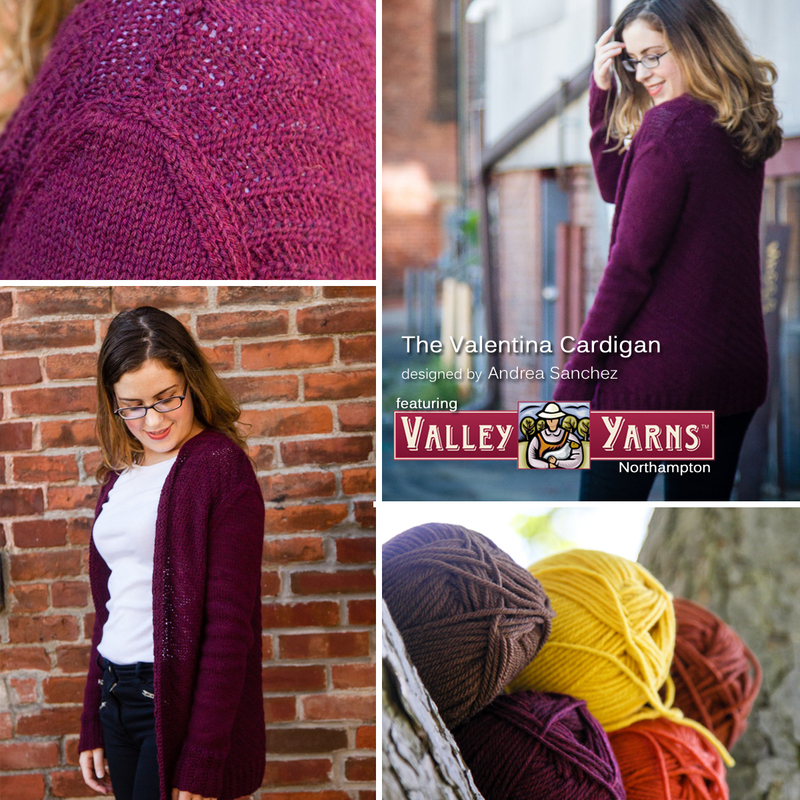 For a larger project, one that will expand your wardrobe for the winter, try the Valentina Cardigan designed by Andrea Sanchez. This long-sleeved open front cardigan is knit in one piece with the sleeves set in. A reversible textured stitch is worked throughout the body and the sleeves are worked in stockinette stitch. A simple garter ribbing adorns the Hems, cuffs, and collar. 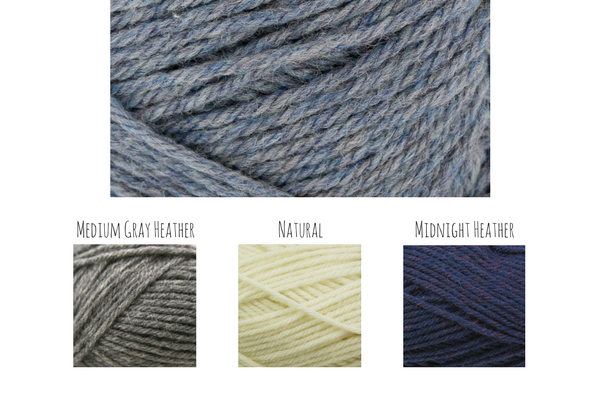 Even the largest size, which needs only 7 skeins of Northampton, is a project that tops out at $50! I’m thinking I need a Valentina Cardigan in Charcoal and maybe another in Apple Green. What projects have you planned in Northampton? Our friends at Smith College created a cute video featuring Northampton. Make sure you check it out, and watch until the end for a special cameo from your favorite yarn store. It’s FINALLY time to put everything together! You may want to take some time and lay all your squares out in a couple different configurations to see which one really clicks for you. Here we have 3 different options for you but they’re not the ONLY ones! Play with the texture and color layout for a day or two before you decide to make sure you’re really happy with it. You’ll note that the last option we show has only 35 squares – you can use that extra one as an accent pillow. 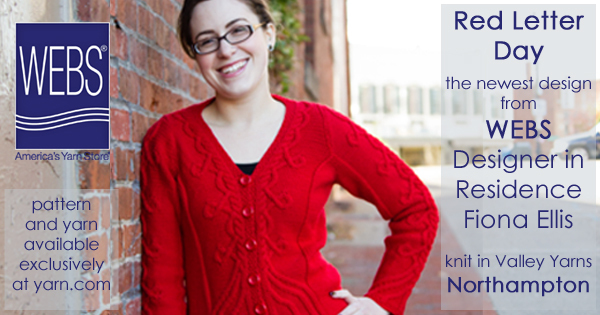 Knitters: We’re offering you two option for both the joining and the edging! For both joining options you’ll need to start by picking up stitches, you then have the option of a three needle bind-off or an I-cord join. Once all your squares are together you can add a tidy attached I-cord edge or be little more fancy and add the Fan lace edge. We’re showing the Fan lace with each row worked in one color from your blanket. Fan Lace Edge – no video for this one as there’s no new techniques, just a combination of one’s you already know! Don’t forget, we have a playlist for the Knit-A-Long blanket on Youtube to make it all easier (Please note that our techniques videos are NOT the patterns! These videos are here to help you understand the featured techniques, but you’ll need to refer to your pattern for specifics.) All the squares and join/edge pattern instructions can be found here. Crocheters: You also have two option for both joining and edging your blanket! As with the knitters options, having a nice clean edge to work on before you start your joins really helps to bring the blanket together, so you’ll want to add a row of single crochet to each square edge before you begin your joins. Joining single crochet is a skill you got to practice earlier in the blanket, as well as a more open lattice double crochet join. For edging you can choose rounds of single crochet or a neat looped chain edge, both are shown with a row worked in each color of your blanket. 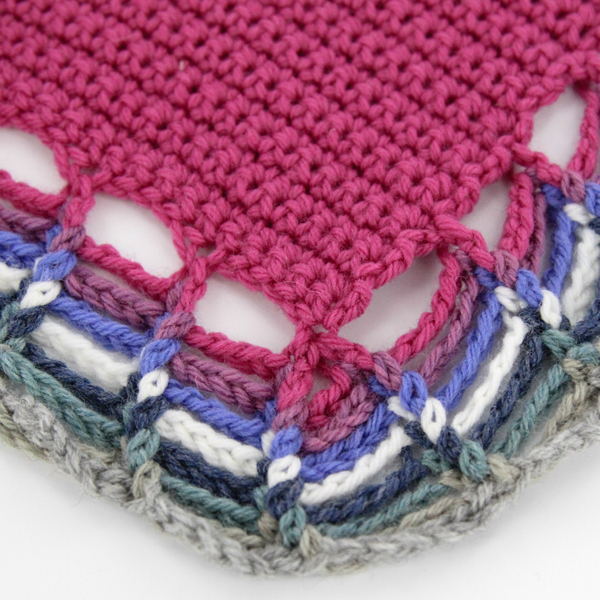 Joining Single Crochet – this one will be familiar from your Tunisian square from March. We can’t wait to see your finished blankets! Are you ready for our last square? Do you have 27 finished squares from February, March, and April? No need to stress if you don’t! Take this project at your own pace and pull all the pieces together on a timeline that works for you. Crocheters: Crocodile Stitch is the name of the game for this square! With a square that is worked on the bias from one corner to the next, we’ll work half the square in crocodile stitch and finish off with alternating double and single crochet. Knitters: This square is all about texture! We’re creating an undulating chevron with knits and purls, broken by embossed sections created with simple increases and decreases. 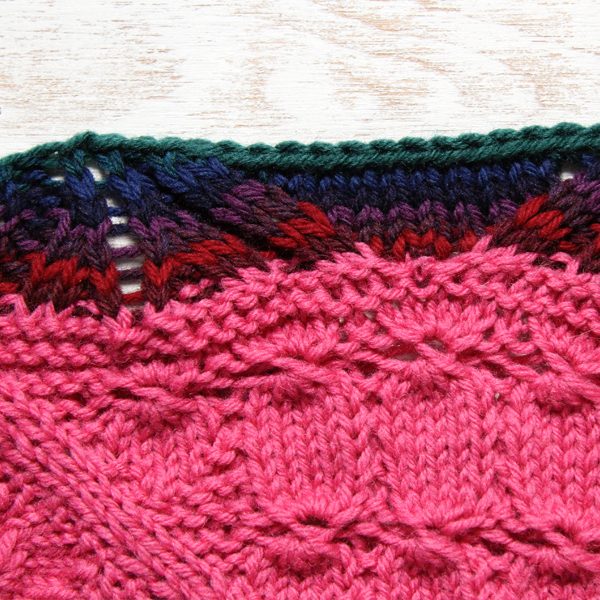 There are no new stitches in this square (yay! ), but here a few tutorial to remind you of the less common techniques. And Make 1 Knit stitches. Don’t forget, we have a playlist for the Knit-A-Long blanket on Youtube to make it all easier (Please note that our techniques videos are NOT the patterns! These videos are here to help you understand the featured techniques, but you’ll need to refer to your pattern for specifics. ), and all the squares can be found here. Next month we’ll put it all together! Are you keeping up? Do you have 18 finished squares from February and March? No worries if you don’t! There are no deadlines but there is lots more to come, and we’re almost halfway done. Knitters: For this square we’re working from the center out and creating a counterpane design, you’ll need double points and a crochet hook for this one! You’ll start out with Emily Ocker’s Circular Cast on – use the shortest double points you have, no longer than 6″! ( 4″ are ideal) and go for a crochet hook that is one size smaller than your needles. If you typically knit on two circular needles or using magic loop you can jump right in with eitehr technique rather than using the dpns. You’ll need to know Make 1 Purl stitches (you’ll remember those from Square one). And knitting 5 stitches together through the back loop! While that may sound daunting we’ve got a super easy solution for you that uses a crochet hook. That’s a big decrease to have in the middle of your work so you’re going to need to add all those stitches back in by working multiple stitches into the same stitch. If you’ve never worked on double pointed needles before we have some tips for you. 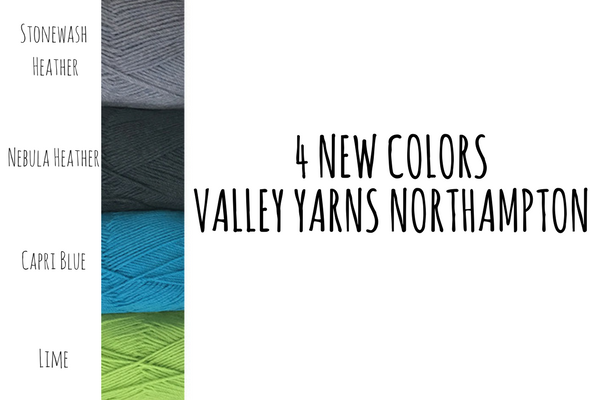 And you’re likely going to finish your first skein during this square, if you’re using Valley Yarns Northampton then you can just wetsplice the end of skein one to the start of skein two and keep going with no ends to weave in! Remember, we have a playlist for the Knit-A-Long blanket on Youtube to make it all easier (Please note that our techniques videos are NOT the patterns! These videos are here to help you understand the featured techniques, but you’ll need to refer to your pattern for specifics. ), and all the squares can be found here. Crocheters: It’s cable time! 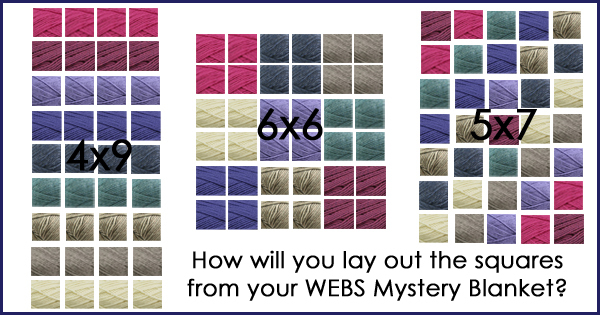 Watch as front and back post stitches stack up and cross over each other to form gorgeous cables and create a solid background fabric with linked double crochet! This square starts with a modified double crochet stitch called a linked double crochet. You get the same height with this stitch but the fabric you create is much more solid! Then you’ll move onto cables. Did you finish all 9 squares from last month?! It’s time to get started on your second set of squares! 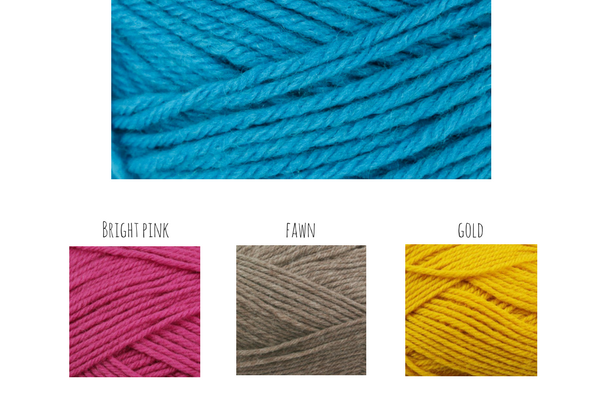 Crocheters: We’re combining traditional crochet and Tunisian crochet! And don’t worry, you won’t need a special Tunisian hook for this one. 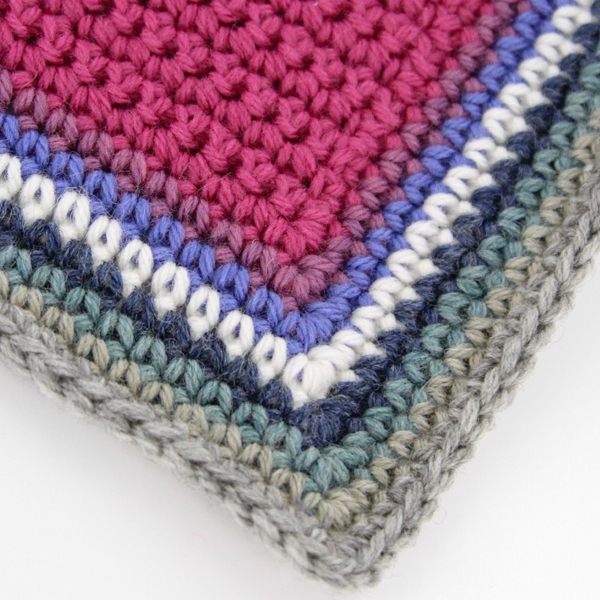 Three strips of Tunisian Simple Stitch are joined together by sections of single crochet and an ingenious joining stitch that leaves NO visible seam! And Tunisian Simple stitch is a wonderful backdrop for embellishments like cross stitch. These small strips of Tunisian crochet are also a great time to practice new-to-you stitches like Tunisian Knit Stitch and Tunisian Purl Stitch, so we’ve included tutorials for those as well. Once your strips are finished you’re ready to join them together and personalize your squares! 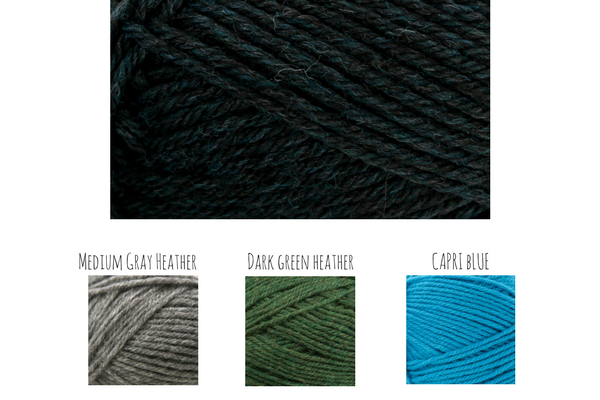 Knitters: We’re cabling! Nothing too complicated but a finished square with lots of visual interest. 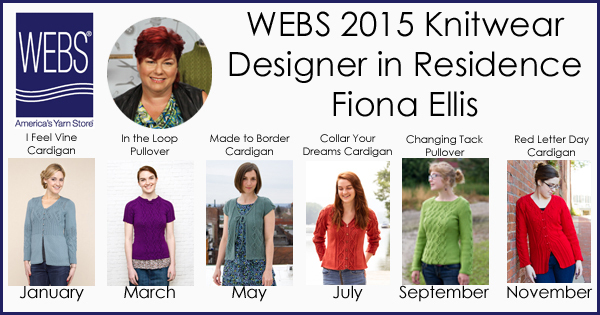 We’ll be working 1 x 1, 2 x 1 cables, we’ll show you how to use your cable needle and how to cable without a needle! It’s finally time to cast-on, or chain to begin your squares! Knitters: We’re making a tiled pattern of embossed diamonds with ALL of the shaping happening on the wrong side of the work! That’s right you’ll be increasing and decreasing on the purl side. It’s also a perfect background for some duplicate stitch embroidery, or a monogram, and this square is even reversible! The pattern can be downloaded here (FREE) and to help you with those new stitches we’ve put together some video tutorials, We even have a playlist for the Knit-A-Long on Youtube to make it all easier. 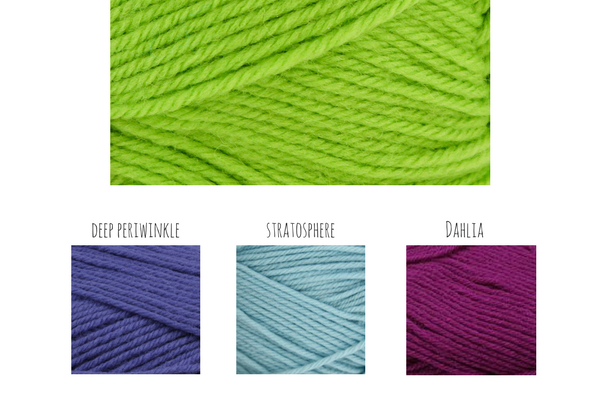 Crocheters: We’re making yo-yos! And before you fret about having to make lots of little circles and sew them together make sure you watch our tutorial video. These little circles are made in two parts and joined as they are created! The pattern can be downloaded here (FREE)and we have a great tutorial video to help you wrap your mind around how this one comes together. There’s a playlist for the Crochet-A-Long on Youtube as well.